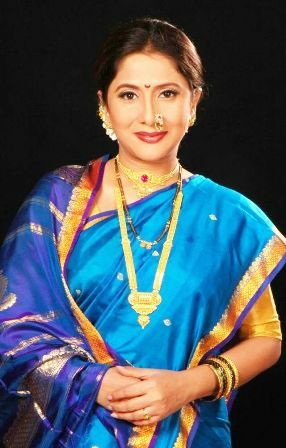 Nivedita Saraf is a popular name in Marathi Films. She acts in Marathi more than Hindi films in India. She was born and brought up in Mumbai on 6th June, 1965 and has got married to a famous Marathi veteran actor Ashok Sharaf. She did her schooling and college from Mumbai itself and has been attached to theatre world to quench her thirst for acting. Some of her plays include Hasat Khelat, Vahto Hi, Durvanchi Judi, Vegal Vhayachay Mala and Sangeet Sanshay Kallol. Now time to dig in deep into her life to get to know more about her. Soon she got the chance to act in small screen. These include the two Hindi TV serials called Sapno Se Bhare Nainaand Sarvagun Sampanna. Soon she got the chance to act in films starting her debut with Hindi film called Naam O Nishan in 1987. However, she got the chance to act in a Bollywood film called Apnapan in 1977 as a child actor. Some of her earlier movies including both Hindi and Marathi ones include Marte Dam Tak, Kashasathi Premasathi. Ghar Mein Ram Gali Mein Shyam, Ashi Hi Banwa Banwi, Thartharat and others. Some of her recent movies include Ashi Hi Banwa Banwi Deoolband and De Dhadak Bedhada.